As the Gulf Coast continues to cope with the aftermath of Harvey, a new threat has emerged in the east Atlantic. Dubbed Irma, this latest storm erupted into a Category 3 hurricane yesterday afternoon—and it’s still gaining steam. Irma is now the fourth hurricane in what is turning out to be an active Atlantic storm season. It was listed as a tropical storm on Wednesday morning, and in a process known as “rapid intensification,” it quickly grew into a highly organized Category 3 hurricane by Thursday afternoon. Irma currently features 115 mile per hour winds (185 km/h), and it’s moving westwards toward the Caribbean at about 12 mph (19 km/h). “Fluctuations in strength, up or down, are possible during the next few days, but Irma is expected to remain a powerful hurricane through the weekend,” notes NOAA’s National Hurricane Center in its public advisory. The storm is expected to gain strength over the next five days, and will likely escalate into a Category 4 hurricane. Irma could reach the Caribbean by Tuesday afternoon, and linger into the following week. Preliminary trajectories show the storm careening towards the Dominican Republic and Puerto Rico. A high pressure ridge to the North is steering the storm westward from its current position in the east Atlantic. 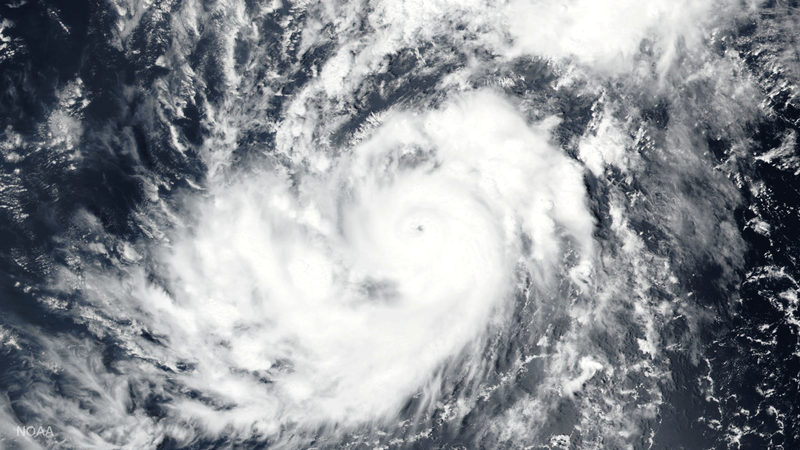 Irma is what meteorologists call a classic “Cape Verde hurricane,” where a tropical storm forms in the far eastern Atlantic near the Cabo Verde Islands and tracks in a deliberate westward direction. Some of the largest and most powerful hurricanes started off in this manner, including Hugo (1989), Floyd (1999), and Ivan (2004). Because it’s still so early, it’s difficult to project Irma’s ultimate trajectory. The storm could slip back out to sea, threatening no one, or it could make multiple landfalls in the Caribbean. It could also veer towards the US coastline (as per the model outcomes shown in the above tweet). Regardless of where Irma goes, it’s still a harbinger of potential things to come. The Atlantic hurricane season doesn’t come to an official end until November 30.